It’s funny how scientists always strive to use science for good (or so one would think), but all too often, science can be deadly and have devastating consequences for people and the earth itself. I could fill this particular article with one example of another where science has been at the forefront of many horrors, but the reader is probably familiar with many of them. Instead, I’ll focus on one that is a modern-day threat to health and life, though that was certainly not the original intent by the scientists who created it. Readers will recall that in April of 2010, an explosion at a BP oil rig in the Gulf of Mexico was the direct cause of millions of barrels of oil contaminating the ocean there. It never should have happened, but it did. Scientists came up with what they thought was the answer in the form of a synthetic bacteria specifically designed to eat up the oil spill. Once released into the ocean – Cynthia, as it was called – began working on the tremendously large oil spill with a rapidity that impressed the scientists. I cannot help but wonder what the scientists were thinking would happen after the oil spill had been eaten up by the bacteria? How would they have even made critical judgments on that? What kind of experimentation had they been able to accomplish prior to releasing the bacteria into the ocean? Anything? We’re not sure, but we do know that the unexpected results of activity by this synthetic bacteria has been largely kept under wraps by our own government here in America. Would we expect anything less than that when things go wrong? I don’t see a problem, do you? Yes, I’m being sarcastic because it angers me that once again, we learn just what science is incapable of determining, but by then, it’s too late. This is reminiscent of the CDC’s own documents noting a link between certain vaccines and the onset of autism, yet denying this reality publicly. There seems to be an undeniable link and the fact that Merthiolate (thimerosal; a mercury-based additive to vaccines), can actually create/release autism in people (when the conditions are right), yet the CDC continues to deny it. The obvious reason would be that they want to avoid lawsuits and if they were to admit the connection publicly, they would be open to a tremendous amount of lawsuits. In spite of the fact that more doctors and scientists are questioning things regarding vaccines and autism, the CDC continues to deny what is reality. Don’t get me wrong. Science has given us many things that have been and continue to be beneficial to the earth and the human race. However, there are too many unknowns in even the best of science and all possibilities can never fully be seen or understood, no matter how “brilliant” a scientist is in a particular matter. We are finite human beings and are therefore, limited in our ability to understand. Yet, too often, we act like God Himself only to learn of our folly later on after much damage has been done. With respect to Cynthia, after gaining access to the human body, here’s what it does. …a person can become Cynthia’s victim under two circumstances: if it penetrated the skin barrier through a wound or if they were unfortunate enough to eat raw seafood infected by this bacteria. Once the bacteria is in the system, it penetrates into the layer between the skin and muscles and starts producing a toxin that disrupts tissues. It is known that Cynthia is capable of reproducing itself rapidly within the infected cells, and that it is immune to antibiotics. In effect, there is no treatment available for this fatal problem. Scientists had no real way of knowing unless time had been taken to experiment on live organisms. Instead, the synthetic virus was released into the ocean and while it was able to eat up the oil spill very quickly, it didn’t just “go away” once the oil was gone. It began eating other organisms in the ocean. Do you see how this can/will cause major problems throughout the world in the coming months or years? Had BP doing what it should have been doing, there would have been no oil spill in the first place. But instead of taking all safety precautions, it did a few things without concern for safety and the result was an explosion that caused millions of barrels of oil to pour into the ocean. The solution was hastily arrived at to release a new synthetic bacteria into the ocean to deal with the oil spill. It worked but has clearly had terrible and even fatal repercussions. This synthetic bacteria are in the ocean and is doing far more than was originally intended. Could all of this lead up to a connection between what humanity has created and God using those things as part of the display of His wrath in the coming seven-year Tribulation period? I think it’s absolutely possible. 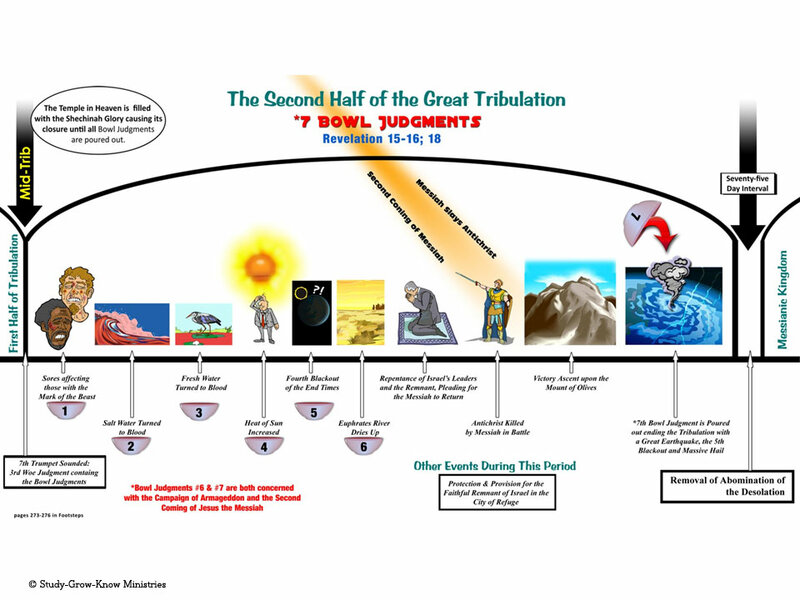 Look at the chart I’ve created below which highlights the plagues that will be poured out onto humanity during the second part of the Tribulation. You can click on the image to open it in a separate window to get a better look at what I’ve included. As noted on the chart, the Scripture text is Revelation 15 – 16 and 18. Notice several of these plagues could easily be related to a bacteria or something similar like “Cynthia.” It could be part of the reason the ocean turns to blood. It could be the reason that sores develop on people. Do we really have any clue as to just exactly what science has created? What is happening in the Gulf of Mexico – is not a regional problem and the residents of this area are not the only ones at risk. This is a problem of global proportions. The signs of a possible bacterial viral infection are already beginning to appear everywhere. The mysterious, unexplained illness affecting fish, marine mammals, animals, poultry, trees, and plants arise from the synthetic genomes that transforms natural organisms and force them to mutate. But in the end, what should the Christian’s reaction to all of these things be? As opposed to creating fear within us, it should cause us to begin looking up in praise to our heavenly Father because His Word is true. It should give us reasons to believe that what God has stated will come to pass. For the Christian, I do not believe we will be here to experience the Tribulation as I firmly hold that the Rapture will occur prior to that seven-year period of human history before the King of kings returns physically. However, we do not know how bad things will get before the Tribulation starts, do we? Even so, there is no cause for alarm. There is no reason to live in fear. It is enough to know that God has all things under His sovereign control. Beyond that, He has promised that He will never leave or forsake us (Matthew 28:20), and that nothing can separate us from His love (Romans 8:38-39). He cares for us and loves us deeply. The Bible provides us a glimpse (and sometimes fairly specific glimpse at that), of what is going to transpire at the end of this age. Entry filed under: Atheism and religion, christianity, Demonic, eternity, Global Elite, Political Correctness, Politically Correct, Politics, Pretribulational Rapture, rapture, Religious - Christian - End Times, Religious - Christian - Prophecy, Religious - Christian - Theology, salvation, second coming, Shadow Government. Tags: autism, CDC, climate, climate change, global warming, gmo, gulf of mexico, methiolate, monsanto, synthetic bacteria cynthia, thimerisal, vaccines.